As many of you know, I am IN DEBT to my undergrad Catholic university (I call the nuns there sharks but really it’s not their fault, it’s higher ed in this country in general). So as a divorced mami to a teen with autism (have you read this blog? ), I decided it was not in me to go the traditional law school route–not because I can’t do the work (I’m as competitive/sharp/committed/stubborn as any of those traditional law students FYI). Anyway, I go to a law school that is not accredited. I chose it because 1) I want no more debt, 2) am willing to pay for the extra study aids/tutors/programs I need to prep–we calculated that cost in my school tuition cost 3) my school emphasizes bringing legal education to the working class–and in giving back afterward and 4) I want no more debt. I just do not want to HAVE to work for a place later, (even a public interest firm), because of my age and my son’s lifelong needs, to pay back more loans. I’ve worked for firms and public interest places and they are just not friendly to a working mother of color raising a kid with a disability like me. Most are geared to those newly out of college or who had no kids, etc., etc. Now if I choose to work for one of those places, that’s a different story, but I won’t HAVE to because of student loans or forgiveness stuff. What this means, in California, I have to pass the First Year Law Student’s Examination–also known as the baby bar exam. If I do not pass, then I do not get credit for my first year of law school and I don’t get to continue in my studies. Also, I’m limited in the states that will allow me to sit for their bar examinations.But, considering I want to stay in California, that didn’t really bother me. Also, the only two other states that I would consider living/working in on a PART-time basis would be Hawaii or Texas–and both states will allow me to sit for their bar examinations once I pass the CA bar exam and practice here for a few years. The baby bar exam I took has a pass rate of about 23%, give or take. The people who take it are like me, but some go to online law schools (mine is not, it’s strictly in-person classes), and others have failed at a traditional law school and are made to take it to remain enrolled. It’s definitely a weeding-out exam. I began studying for it part-time in January and in March started a serious regimen of study. In May it got worse, it’s all I did for 12-14 hours a day. Not only did I do practice stuff, but I took a total of about 8 mock exams (simulated like the real test) and did 1800 MBEs, which are the worst and ugliest multiple choice law questions you have ever seen. 1800! Are you kidding me! I took the test on June 24th. I got up that morning and lifted weights Rocky-style in my backyard under the morning sun. To my husband’s embarrassment, I also wore Depends to the exam. NO, I did not have to use them, but damn if having them on didn’t make me feel better during that exam. 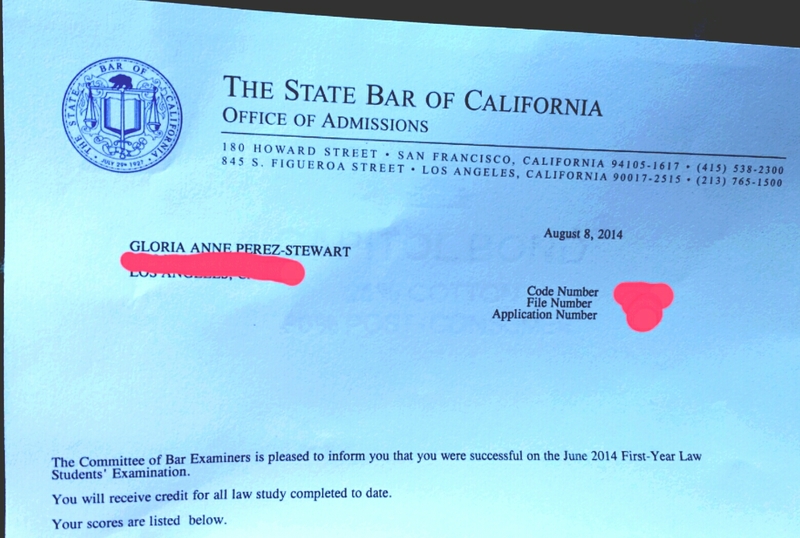 It was a daylong exam and it nearly broke me (FYI the CA bar exam is THREE days long, so I got a taste of my future). I came home and drank. A lot. My husband had to put me to bed. But I got through it. Then I basically waited for a month and a half for the results. I may have drank some more. I got my results this Monday and almost fainted before I opened my letter. And found out I passed! I am exhausted but happy. Of course, in 2 1/2 years, I begin the grueling bar exam prep–which will take me about 6 months (or more) of study. But now? Let me have a moment of bliss.